UPDATE: The Spicewood Destruction Derby has been rescheduled again for Sept. 22. It was originally to be on Sept. 8, but rain forced it to be postponed until Sept. 15. Due to more rain in the forecast Sept. 15, organizers moved it to Sept. 22 and will hold it "rain or shine." Check out the Spicewood VFD-EMS Facebook page for up-to-date information. 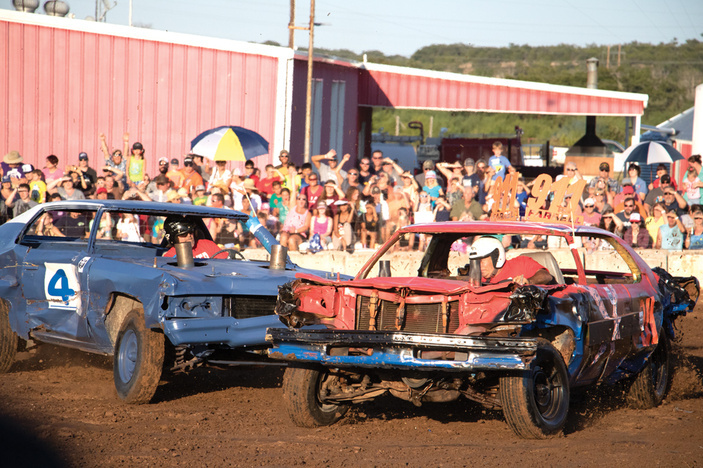 SPICEWOOD — Crashes at the annual Spicewood Destruction Derby might be the main attraction, but there's also a comedic side show: laughing at family and friends in the stands who've been splattered with mud from spinning tires. After all, what’s a Destruction Derby without the destruction? The 27th annual fundraiser for the Spicewood Volunteer Fire Department and EMS is Saturday, Sept. 22 (it was previously scheduled for Sept. 8 and 15, but moved due to rain), at the fire hall, 9805 Texas 71 East. Gates open at 4 p.m., and the engines start at 6 p.m. Admission is $10 for adults and $5 for ages 12 and younger. There will be food trucks and beverages available at the event. No coolers or pets are allowed. Patsy Lester, a member of the derby committee and Spicewood EMS director, said large concrete blocks in front of the bleachers protect spectators from the vehicles, but there’s nowhere to run from the mud. Still, it doesn’t keep the crowds away, Lester said. “It’s pretty much an adrenaline rush,” she said. “When somebody hits somebody, the whole crowd goes crazy. I don’t know what it is about it. I guess it’s the idea that somebody is watching a wreck happen. “I think it (is similar to) riding a bull,” she added. “It’s exciting and it’s different." Derby vehicles have to move every three minutes to continue competing — the last one moving is the winner. While drivers of stalled vehicles are furiously trying to get going, Lester said the other drivers will take a shot at them. And those who can't get their engines running again? Then, there’s the lower-west corner of the track itself. After a heavy rain, which usually happens before the derby, that corner turns into a mud pit. At least one unlucky driver gets stuck in the pit every year. The derby was first suggested by a couple who had moved to the area from Houston, where similar events were a smashing success. The inaugural Destruction Derby in 1991 drew 15 competitors. It now brings in more than 30 as well as several thousand spectators. Lester noted the derby draws drivers and people from outside of the Highland Lakes. And just like some of the cars themselves, Lester said the department can’t get out of it. “We’re stuck,” she said jokingly about organizing the event. If you get a front-row seat at this year's Destruction Derby, remember to cover your nachos. Go to spicewoodvfd.org for more information.